This time of year we all have resolutions. Maybe it’s to lose 7 pounds, improve your daily workout, drink more water, mediate each morning. 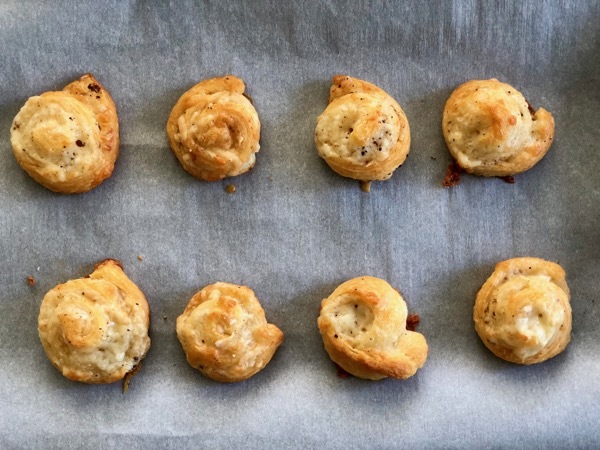 I know these are all on my list, along with another… to start making gougères. You might wonder what the heck is that!? 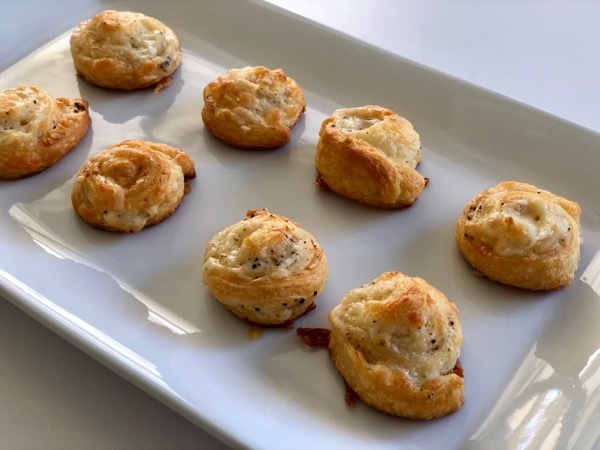 A gougère is a delicate little cheese puff made with a savory pâte à choux. À pâte what?! You might be asking if you can’t type it on a regular key board then how could you possibly make one, and why should you even try. Most resolutions sound wonderful when you whisper them in your mind. Everything is rosy until you actually pick up a wooden spoon and vigorously stir flour, water, and butter into a dry ball over medium heat for over eight minutes. 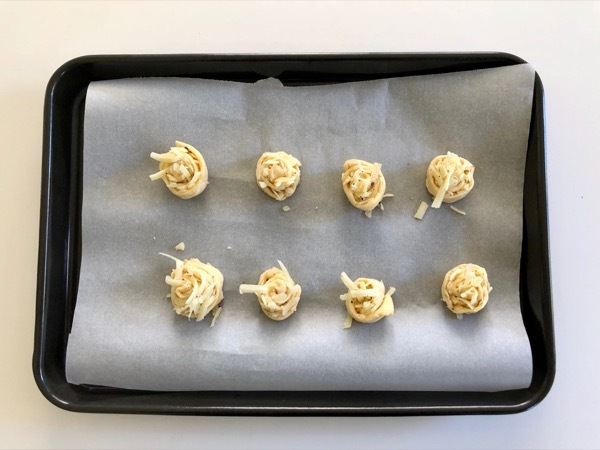 Before attempting to fully incorporate eggs one at a time, then folding in gruyere cheese and piping the dough through a pastry bag onto parchment lined baking sheets. Ok, it’s now obvious why I’ve not yet tackled this recipe. But then the uncanniest thing occurred. 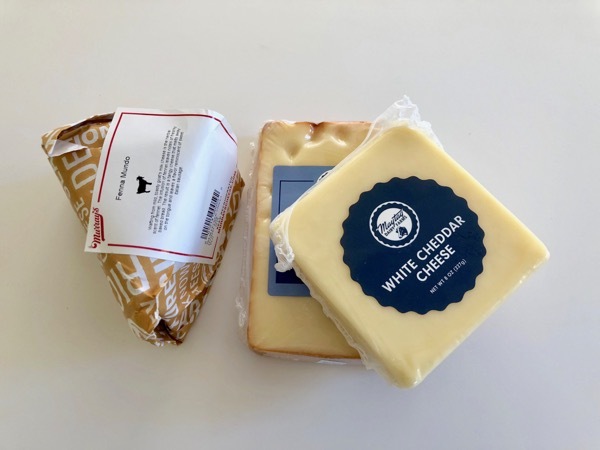 I opened the frig and saw a half a can of crescent roll dough (don’t ask) and several blocks of fine cheese (that we had received for Christmas presents). 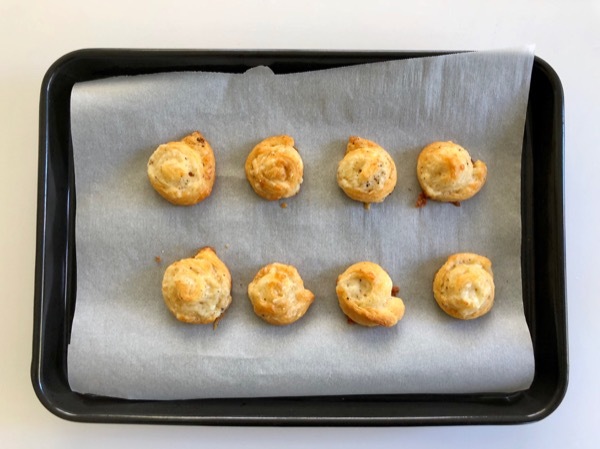 Could this possibly be the makings of a forged gougère? You are not going to believe how easy these are to make and how freaking fabulous they taste. 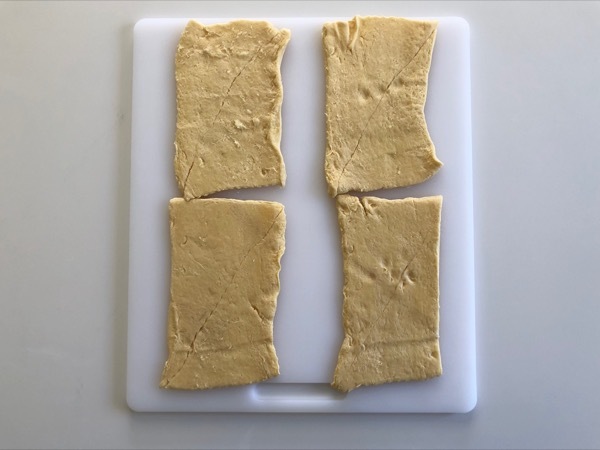 Best yet, you can freeze them ahead of time. So, you can pop them into the oven whenever the mood strikes. And the timing for this discovery couldn’t be better because on February 7th I’m teaching a Girls’ Night Out cooking class at Dorothy Lane Market’s Culinary Center. The theme is elegant appetizers that are easy to prepare. Well it certainly doesn’t get any easier than this. But as with all good shams you need change the name. 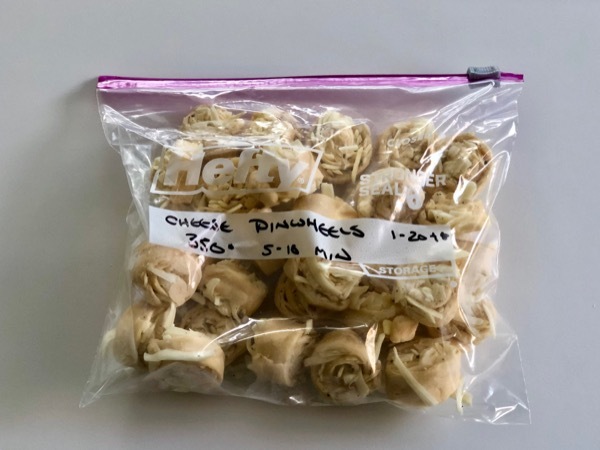 How about “cheese pinwheels”? Believe it or not, these start with a can of crescent rolls. 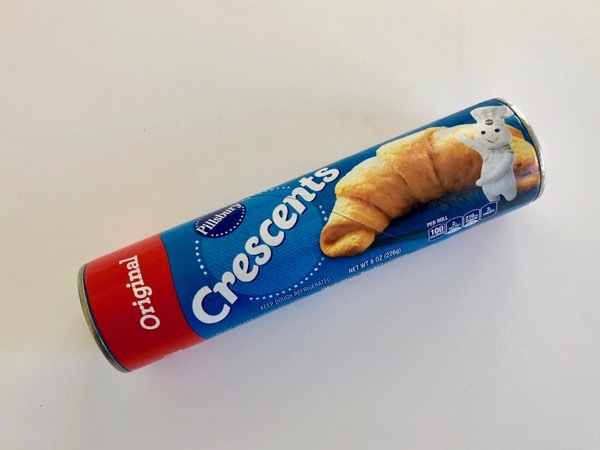 Give the can a crack and unroll the dough on to a cutting board. 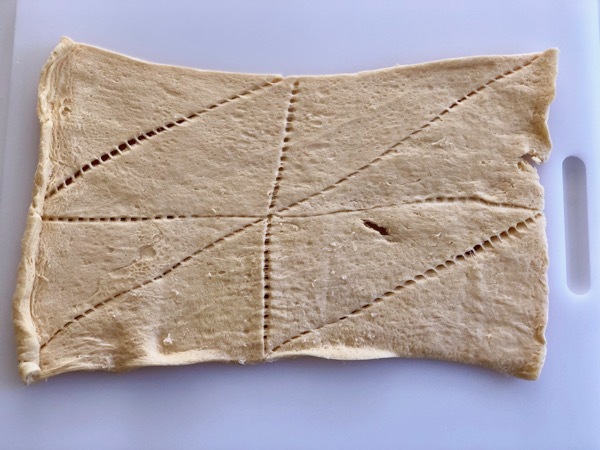 Then separate the dough into four rectangles. Pinch the diagonal serrations together. Since you’ve gone lowbrow on the dough, splurge a little on the cheese. This is a great way to use those good leftover hunks that have been stowed in your frig. 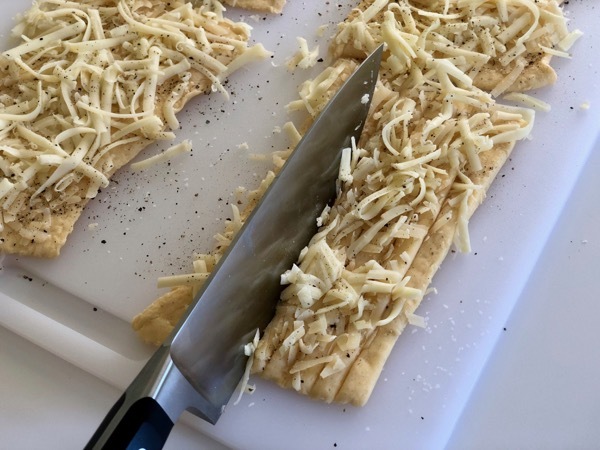 Scatter the grated cheese over the dough. Sprinkle with a little kosher salt and a few generous grinds of pepper. 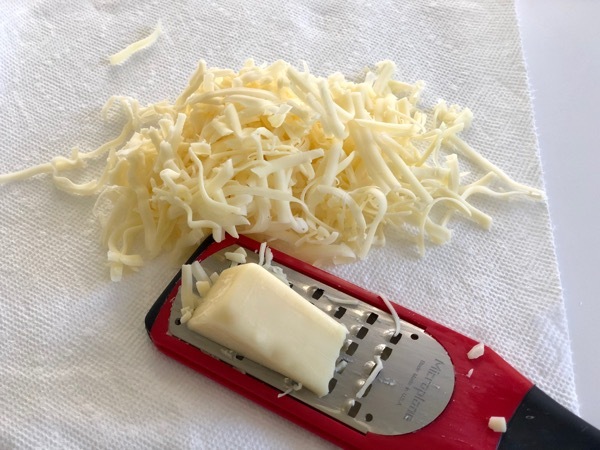 Press the cheese lightly into the dough with a flat hand so it adheres. 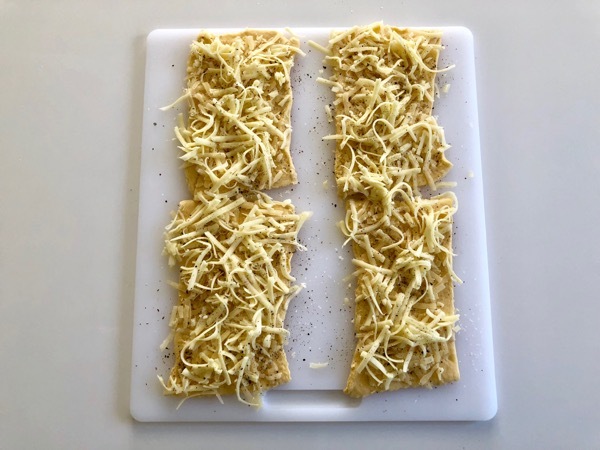 With a sharp knife, cut each rectangle into quarters lengthwise. Then cut each strip in half lengthwise to make eight thin strips. 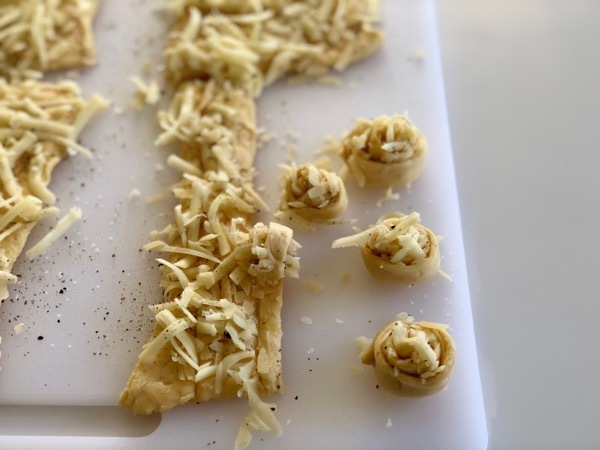 Roll each strip into a pinwheel, the cheese will hang out on either end. Place on a foil lined rimmed sheet pan. Cover tightly with foil and freeze for several hours until solid. Put the frozen pinwheels into a Ziploc bag and freeze. 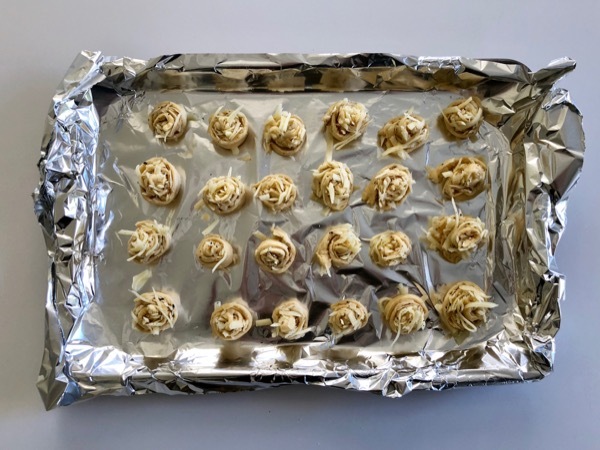 Place on a parchment paper lined baking sheet, don’t use foil as it might tear and stick to the bottom of the cheese pinwheels. Bake at 350 degrees for five to ten minutes until puffed and golden. Serve hot from the oven. This is one resolutions you are sure to keep! Hello and good morning fellow bloggers. I have tested these delightful Sandy treats first hand and can tell you they’re absolutely fantastic. Happy eating!